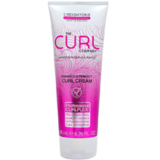 We are a curl dedicated brand with a range of products tailored to suit every curls’ needs. Professionally formulated to lock in moisture, de-frizz and perfect with key curl-friendly ingredients Moringa and Meadowfoam Seed Oil. Made in England and empowering curly women everywhere with products that help them to get the best from their natural curls, waves and coils, so that they embrace their natural texture! Enhance, Define and Perfect your curls.